For that long weekend away from the ‘smoke’, why not stay at the Tongdam Guest House. 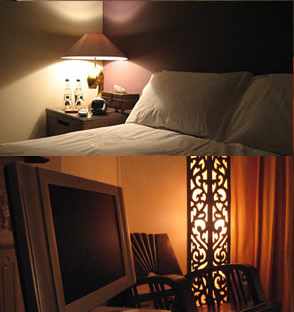 We have just 3 well appointed rooms, all fitted with wide screen LCD televisions, satellite TV channels and DVD & VHS. Each room contains modern and old Far Eastern furniture, combining a style and comfort that will set the mood for your stay. We offer a full English Breakfast menu, made up of locally produced eggs, bacon and sausages and platters of fresh fruits, yogurts, fruit juices, cereals and toast & marmalade. All washed down with an endless supply of fresh coffee or your chosen tea. For your lunch, we can offer our East meets West extensive menu or if preferred, our Tongdam rucksack, filled with a chosen feast of foods, chilled wine and hot coffee, perfect for that picnic on Exmoor! On returning from your day’s adventure, settle down at the Bar or relax in your room with an evening aperitif before joining us for a meal to remember, where your senses will be revived and satisfied, before returning to your room to watch perhaps a movie from our extensive library. Room 1: Our master double bedroom with balcony includes an on suite and its own sitting room, with televisions in both main rooms. Cost Per Night for Two Persons: £75.00 including full English breakfast. Room 2: Our second double bedroom, including television, offers a spacious and comfortable room with the use of a shared bathroom. Cost Per Night for Two Persons: £60.00 including full English breakfast. Room 3: Our third double bedroom, including television, offers an interesting cottage like room with use of the shared bathroom. Cost Per Night for Two Persons: £56.00 including full English breakfast. Full Board Rates: Available on request.